' ...a powerful portrait of a complex individual. It uses Napoleon's own words to show his genius, arrogance, insecurities, and frustrations. This makes it an invaluable reference book that should be on the bookshelf of anyone interested in the period.' Rob Burnham, Editor, Napoleon Series. In the words of Napoleon is a startling insight into the life and deeds of Napoleon I. 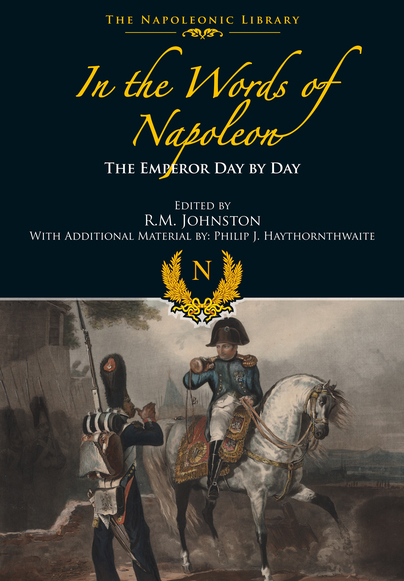 Derived from Napoleon's extensive correspondence and his other writings and recorded speech, this valuable compilation acts as a diary or journal, encompassing the whole of the emperor's life. Napoleon's words - as recorded on a particular day - are set down as 'entries', and these offer a unique glimpse into the major events of the Napoleonic period. The diary reveals Napoleon's thoughts and actions as his great life unfolded and throws light on his attitudes to war, politics and the many varied personalities who surrounded - or opposed - him. As entries appear on an almost daily basis, the reader has the opportunity to trace the surging course of events as they happened, and to witness the emperor's response to the rise and fall of his fortunes. Philip Haythornthwaite provides a fascinating introduction which analyses Napoleon's words, and includes biographical sketches of the key personalities of the era.